Sarajevo Airport has announced plans to demolish its old Terminal A building (pictured) to make way for the multi million euro expansion of its Terminal B facility. Tender procedures for the demolition of the A building, used for commercial traffic between 1969 until the outbreak of war in 1992, have begun, with the process expected to be completed by June 14. "The old terminal will be demolished to allow for the expansion of the existing Terminal B. As a result, the terminal will have seven instead of four gates, as well as 28 check-in desks, up from the current seventeen", an airport spokeswoman said. She added, "The departure lounge will also be expanded, as well as commercial and retail space". Work on the expansion of the Terminal B building is set to commence during the last quarter of the year. Upon completion, the facility will have the capacity to handle two million passengers per year, up from the current one million. Previously, the airport planned to covert the A building into a low cost terminal. By using the older facility, the airport anticipated reducing service charges and luring more budget airlines. However, these plans were shelved last year with a change in management. The planned demolition of the old terminal and the expansion of the facility currently in use is valued at twenty million euros. Sarajevo Airport handled 84.137 passengers in May, representing a decrease of 1.9% compared to the same month last year. The softer results were recorded despite an increase in the number of aircraft movements this May which stood at 1.156, up from 1.034, or 11.8%. During the first five months of the year, Sarajevo Airport welcomed 305.813 travellers through its doors, an increase of 5.1% on 2016. The number of flights operations also grew, from 4.221 last year to 4.672, up 10.7%. How april was so strong and then -2% in may? April was strong at all airports in ex-Yu because of Easter. But the numbers in May are a big disappointment at SJJ. The idea to turn the old terminal into a low cost one was actually smart in my opinion. Still I'm happy the airport is getting expanded. They should demolish their taxes, not the terminal. That's like saying Wizz should give up on their greed and start flying to SJJ with current taxes. We all know Wizz would make money on SJJ flights with current prices but not as much as if SJJ prices drop by 50%. It's really just the greed that's stopping Wizz. I am sorry but I think it has to do with SJJ's greed... how much money have they accumulated from the €18 airport development tax? How much of that was actually invested in the aviation market? Where is your worry when it comes to how much of Wizz profits gets invested in local aviation market W6 serves, and how much is sent back to Hungary, USA or offshore accounts? Wouldn't it be better to keep this building just in case? It could be developed in the future. Could they have expanded to the other side? Or is that occupied? wtf? More flights in May, less passengers. Maybe Ramadan had an impact? Don't Muslims tend to travel less during Ramadan? Yes they travel less. Last year Ramadan was in June and there were 10,000 passengers less than the year before. Is that bigger than old Zagreb airport? Zagreb's old Terminal is 15500sqm, had capacity to handle max 2.5 million pax. So no it is not bigger, even when new section is added, I presume it'll increase the size of Sarajevo terminal to around 10-12000sqm from present 7000sqm. I presume fully expanded Sarajevo terminal should be around 115x65m or around 12000sqm of useful space when all added. 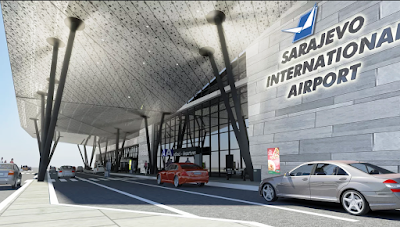 So even with full expansion Sarajevo terminal will be smaller than Zagreb's old terminal. However, Sarajevo airport will have slightly larger capacity due to modern passenger flow design. I think around 2.5 million easily pax achievable. So what was in this terminal since it stopped being used until today? Where will those be located when they demolish the building? I remember a while ago that they were talking abut building an office building next to the airport to house all the administration. - On their launch website they posted a poster of Dubrovnik and not Zagreb, could someobody explain that? I would add another thing and that's that DBV is far more high-yielding than ZAG is meaning that it will be easier to fill the front of the cabin. Also, I found it so strange that they put the picture of Dubrovnik while launching Zagreb. I am happy I wasn't the only one. Maybe DXB-DBV-ZAG-DBV-DXB could have worked better? Market is much biger in Zagreb then in Dubrovnik. Dubrovnik could work only during the summer - but during the winter, apsolutely not. Many people from Slovenia, northern Bosnia and southern Hungary travels with EK from Zagreb and also EK sales flights to DBV SPU, ZAD and PUY via ZAG, so that's quite enough. C'mon DBV can even fill 4 pw A319 TK during the winter, and they want EK ...c'mon guys be realistic. Well in summer the market to DBV is incomparably bigger than in ZAG. Look at the May growth in both SPU and DBV, it's epic and they are the future of the country. The surrounding infrastructure (access roads) of DBV is not comparable to that of ZAG. Zagreb is a city with a decent population, and its location iis central to cater to the needs of coastal Croatia, as well as the neighboring Slovenia and Bosnia, in small percentage even Austria, Hungary and Serbia. The poster says "Hello Croatia" and it's Split on it, not Dubrovnik. Passengers can use OU's flights to reach the coast and, like someone already wrote, EK doesn't do seasonal flights. Excuse me but no one in Serbia, Hungary or Austria will use EK out of ZAG. Why should they when there are other airports which are much closer. Especially BUD for Hungarians who have their local trains and buses offering much better connections to their capitals than to Zagreb. Passengers from Asia can also fly to Split and Dubrovnik via VIE and MUC. Both OS and LH send jets to these cities, much better than a noisy turboprop. I think the biggest problem for ZAG in the future will be to find a way to deal with the growing presence of lowcost carriers at LJU, OSI and TZL. While tourism is extremely important for Croatia, it isn't everything. It accounts for 18% of GDP. Zagreb, on the other hand is the capital city, an industrial center, with metropolitan population of 1,2 million, accounting for 40% of overall Croatian GDP, and on top of it all, it had the same number of tourist visitors in 2016. as Dubrovnik. Or slightly more even. And it isn't seasonal market. It also has great OU connections to all coastal cities. That's why Zagreb and not Dubrovnik. Michael, I know you tend to downplay our growth at DBV (even SPU) but the growth in passenger numbers is a good indicator of things to come. Already this year SPU will come extremely close to ZAG. Also look how much SPU has narrowed the difference! SPU will have more than 2.5 million this year. Because for most Austrians VIE, VCE or MUC are much closer than ZAG. Please, be realistic. As if any Austrian will go to Zagreb when he has the A380 out of VIE. The arrogance and delusion is out of control. Jesus Christ. It doesn't take a genius to see that Dubrovnik and Split are highly seasonal airports and if even smaller planes can't fly to these destinations year round, how the hell would EK do that? To Dubrovnik or any coastal airport you reach via Zagreb in no time. What you'll do with the fact that both airports have so much more passengers in July/August, when half of the year they can't reach 100k. Get real. I highly doubt anyone from Graz would go to Zagreb because of 20 km. Not to mention that VIE has more options to chose from and the city has phenomenal road and train links with teh Austrian capitol. For all the Dubrovnik fanboys - one sobering fact that none of you realise is that Dubrovnik has little to no outbound market - it is virtually all inbound. ZAG on the other hand, is a capital city of significant size WITH an outbound market - which is what sustains a route year round ... end of story. What are you talking about? If somebody from Graz finds a good option from Zag, he will fly from Zag. And yes, the roads from Graz to Zagreb are perfect. You are saying basically that nobody from Austria will ever choose Zagreb. Then why people from regions bordering Serbia (Hungarians) choose Belgrade? Whats the difference? They can choose Budapest. Or not? First off Zagreb is way more important as a destination than Dubrovnik or Split. It is a capitol of the country, EU capitol, NATO capitol. Traffic is year round and not seasonal. Split and Dubrovnik are seasonal airports operating from April to October. November - March airports are almost dead. No one flies there. Actually Tourism is important for Croatia, but not crucial, what is more important is industry and exports. They're generators of real growth. Even with 10-12% growth in number of visitors to Croatia, GDP only registers increase of 1.2/1.5% increase in GDP growth due to Tourism. Croatian economy is projected to grow between 3.5 and 4.2% this year. So Tourism helps, but Dalmatia can't live of Tourism year round. We need industry, exports and construction to move us in to the black each year. Road between Graz and Zagreb is terrible because Slovenia still blocks the finishing of the motorway near Maribor to Croatian boarder. In summer there's daily traffic jams with very long travel times there. Don't forget the recent checks on the border which makes lines and waiting times even worse. Emirates themselves have issued a public statement in which they described Zagreb as being ideally positioned to cater for the passengers originating/arriving to Croatia, Slovenia, Bosnia & parts of Austria and Hungary. You guys are so strange. No one from Dubrovnik wrote that. I guarantee. That is nothing else but provocation. @anon on 3/6 at 1:03PM You know I am downplaying the growth at SPU & DBV?? You clearly know nothing, as I am not downplaying anything. Quite the opposite, I am happy for the sucess of every Croatian airport. I'm simply being realistic, I'm not from Zagreb, nor am I from Croatia and don't care for local patriotism. Way too many people here tend to get emotional and cry foul when confronted with facts, or just common sense. The rest on why a non-seasonal capital city, 20 times the size of Dubrovnik and a cultural, financial, economic, industrial, businesses...etc. center of the entire country makes much more sense in terms of having Emirates flights, has been explained to you by others. As for Split...it's been 600,000 pax behind Zagreb for years and that'll remain the case this year as well. May figures are really disappointing. Hope they bounce back in June. Will Qatar Airways finally announce the launch date for Sarajevo??!! Seriously it's been over a year! They started selling tickets then they pulled them, then they said it was a "priority". I think they will start in October but they haven't scheduled it yet. They are waiting on late plane deliveries. I think they will just cancel the Sarajevo flights in the end. @10.53 can SJJ handle the B787? I think Kuwait did with their A300-600. I hope some new European carriers will coma with this expansion. Wizz Air should open some new routes. With the current charges, there is little chance for Wizz Air or any other LCC opening new routes. Wizz Air has increased LCA to two weekly, year-round. The Wednesday flight used to be operated only during the three summer months and around the Christmas holidays. Great news for BEG. Air Serbia will operate three weekly flights. Wizz increased other destinations from Belgrade (from MAY19). Malmo from 4pw to 5pw, Dortmund from 3pw to 4pw, Eindhoven from 3pw to 4pw, Goteborg from 2pw to 3pw, Memmingen from 2pw to 3pw, Stockholm Skavsta from 2pw to 3pw. + new four new destinations(Malta, Hannover, Friedrischafen, Nuremberg) all 2pw. Of course but the LCA increase was related to their winter timetable when it was operated once a week with the exception of Christmas holidays. Let's see if there will be any other changes to their BEG network. I am happy JU is sticking around to fight for the market. Btw seems like Vueling is off to a bad start this summer at BEG, their flight tonight is late by over an hour. Hopefully traffic growth follows capacity expansion. How will they finance the project and when is the planned completion date? Agree with the comments that they should have gone and converted the old terminal into LCC one instead of demolishing it. When is Qatar Airways coming to Sarajevo? I personally think it´s a very good idea to demolish it because it´s better to have everything under the same building. Just imagine in the future, Wizzair using the super old building and, say, JU uses the new one. So? In BEG Wizz uses the old terminal because of lower costs. I think the issue with SJJ is that it's too small to have two different buildings. It will increase the costs... but then again, I highly doubt the management really cares about that. Looking forward to new terminal in Sarajevo, hope for Qatar and Wizz in the near future. Good luck! Just as I thought so.... 60 messages for SSJ airport ? Nope !!!! As always half of them and a little bit more are about JU , CROATIA and BELGRADE, no surprise at all!!! The overwhelming majority is about Zagreb. I think it's nice, we should embrace diversity in all of its forms and shapes. People are interested in the topic they just are not commenting too much on it. Already 67 shares on facebook which is a lot. Those Sarajevo pax numbers show more than clear how higly seasonal and holiday depending air traffic across the ex-yu is. And it doesn't matter if you are SJJ, DBV, BEG or whoever, it's the same. Yet many throughout the region stay convinced and self delusional of their utter importance, claiming to have important airports, hubs and big national airlines. In reality that's only peanuts. Most ex-YU cities succeeded in achieving great results. I think SJJ must try and apply some of their models. Even TZL managed to base 2 aircraft already and they are definitely going to beat SJJ given it doesn´t do anything. Yes, we know there is a demand from Gulf countries but this is just not enough. The market will soon be saturated with Gulf destinations and supply will beat demand. At least we will see a new terminal soon, but will they manage to fill it? EW started DUSSJJ as an addition.